All tickets for kitchen orders need to be placed in the same location by the table service staff every single time. Do not have multiple order queues or locations for order tickets. Make sure they are clearly visible and that kitchen staff know to keep tickets next to orders so that they can be plated and served or boxed and bagged correctly as needed. 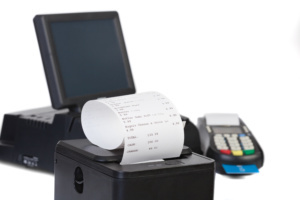 Most restaurants have a ticket printing system as a part of their point of sale. 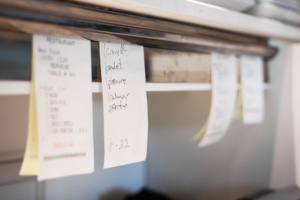 This allows servers to print tickets that have been entered and clip or spike them to an order board that the kitchen staff can easily see from their cooking stations. This is often above the warming stations so that finished dishes can be set next to their respective tickets to make things easier on the servers. Other restaurants with an integrated order and POS system have a display screen for the kitchen staff that lists orders as they come in with station numbers. Chefs and line cooks prepare the orders and then make sure that they place them in the correct numbered slot on the warming area to ensure they get to the correct customer. Whether you do it digitally or the old fashioned way, a centralized location for placed orders is a must-have for both the wait staff and the kitchen. This is nearly as important as keeping all of your tickets centrally located for the kitchen staff. If you enter online orders and in-house orders on the same POS system before printing and posting for the kitchen, you need to make certain that you make the online order tickets look different from the in-house orders. This can be as simple as programming your POS to print ONLINE on the online orders in large friendly letters, and DINE IN for the orders that are taken at the tables up front. Additionally, you can keep a highlighter by the POS ticket printer and train your staff to stripe online orders with the highlighter before posting them to the kitchen staff. That way there is no confusing dine-in orders with online orders because all the staff has to do is look for is that highlighter stripe and they know where the dish will go after it is prepared and plated. Chances are if you have a point of sale system that was designed and sold in the past decade, it already has a system for tracking orders. However, that system may not necessarily be integrated with your online ordering system on your website, meaning that a staff member has to manually enter each on line order as it comes in. Even if you have a mobile app, your restaurant has developed to make ordering as convenient as possible for hungry customers with limited time to order and pick up their food, it may still require you to have a member of your house staff punch in every order into the POS and print the tickets out for the kitchen staff. Thus, it is essential to make sure that your POS system is completely integrated with any online ordering systems you currently have in place. It is far better to have the POS system you already use automatically printing online order tickets so that the wait staff can post them for the kitchen to prepare. Online order integration also allows you to remove the potential for human error when your staff is entering and printing online orders from a separate system. All in all, it is essential to your daily operations to keep all of your orders, online and otherwise, in a central location within your restaurant. As orders stack up online and from the guests in your dining room, it is all too easy for tickets to get lost in the shuffle. These missed orders lead to unhappy customers and bad word of mouth publicity for you and your establishment. Make sure that you are organizing your ordering system effectively and train your staff accordingly. A single place for all your orders, digital or physical, saves you, your customers, and your wait staff from a multitude of headaches. Make order from chaos and get your ordering system set up right today.